Within the framework of the establishment of World Green Crescent Federation led by Turkish Green Crescent Society, the establishment of Thai Green Crescent was already launched.The president of Yeşilay 70th term, Prof. Dr. M. İhsan Karaman and the manager of foreign affairs, Ahmet Zeki Olaş visited the Pattani province of Thailand for the establishment of Thai Green Crescent and also participating to Thailand Islamic Medical Association Annual Meeting. Meeting with Thai Green Crescent Executive members, the experiences and consultation were mainly discussed regarding the organizations, strategic plans and nation-wide projects to develop cooperation between two parties. It was stated that Thailand is in a great danger of drug trafficking due to its critical position like its neighbor, cross border regions of Malaysia. Unfortunately, there have been inadequate source of knowledge about the statistics on drug abuse that is presumed to have higher numbers. Thai Green Crescent executive member, Dr. Lutfee Hajimat said, “We will have other NGO’s collabarate to be actively involved in the process of standing against addictions through opening new branches in different regions of Thailand and Bangkok”. Prof. Dr. M. İhsan Karaman made opening speech in TIMA annual meeting held in Yala Rajabhat University. He explained Yeşilay’s continued international works and the activities planned within this scope in Thailand. He also pointed out the expanding experience of Yeşilay for being a leading actor in the establishment of the Country Green Crescents around the globe. The evaluation meeting of Thai Green Crescent was held in Fatoni University with the executive members and Yeşilay representatives. 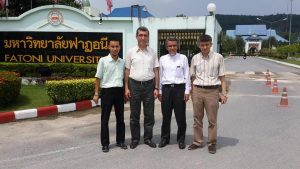 In this meeting, Prof. Dr. M. İhsan Karaman clearly stated his appreciation for Fatoni University which has great contributions to the establishment of Thai Green Crescent and Yeşilay is always open to share its scientific works with Fatoni University to develop and maintain cooperation constantly thus implementing effective methods and approaches.